Although the medical understanding of hair loss, especially that loss associated with male pattern baldness, has come along way in recent years, there are still a few popular myths regarding the cause of this hair loss circulating. Unfortunately, these myths are still very much believed. However, not even one of the most common myths has any basis in science or fact. The most common myth surrounding Male Pattern Baldness is that the genetic predisposition for this condition comes from genes on the mother's side. However, this myth is not true. 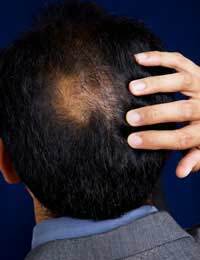 Male pattern baldness is Genetic And Hereditary but the hair loss gene that causes this condition can be passed down from either side of the family, can come from relatives other than parents, and can even skip a generation or two before becoming apparent again. The second most common scientific hair loss myth is that losing a certain number of hairs each day (usually numbered at 100) is a direct sign of hereditary baldness or Permanent Hair Loss. This myth is not true either. Normal shedding of 20 to 100 strands of hair a day does not indicate unusual hair loss. Hair loss is better indicated by extent of hair growth. If you notice increased hair shedding, you should only be concerned if there is also a reduction in new hair growth over time. The third and final most common scientific hair loss myth insists that you can increase the number of hair follicles currently in your scalp through treatments or medications. This, however, is not true. Every person is born with the exact number of hair follicles that they will have throughout their lives. The only exception is when hair follicles are increased by surgical procedures such as hair transplants. Another common area for hair loss myths to crop up involves hair care techniques and practices. Again, most of these myths are untrue. The most common hair loss myth in this category is that the excessive use of hair care products can cause premature hair loss. Hair loss can be caused by illness, disease, the taking of certain medications, and genetics. It cannot be caused by a certain shampoo or styling product. Just as hair products cannot cause hair loss neither can the way you comb or style your hair. As long as you are gentle with your techniques and you use them with moderation your hair will not be permanently damaged. The only way that brushing, combing, blow-drying, or other hair care techniques can "cause" hair loss is if you are already suffering from the condition. In that case, any aggressive techniques or handling can worsen the hair loss but will never actually cause it. Finally, the most believed yet untrue, myth about hair care and hair loss states that if you cut your hair it will grow back thicker. This is not true, of course, but it is easy to see how the myth started. When an individual shaves the hair of their face, legs or under arms the hair grows back in thicker and coarser. However, because this hair has different properties than the hair found on the head the same rule does not apply. Cutting the hair on your hair will only make it shorter and it will continue to grow at the same diameter and speed no matter how many times you cut it. Although most hair loss myths have some base in science some seem to come out of nowhere. One popular hair loss myth leads individuals to believe that the continuous wearing of a hat can lead to premature baldness. Unless the hat that you chose to wear was so tight that it could cut off the blood circulation to the hair follicles, it wouldn't matter if you donned a cap 24 hours a day 7 days a week. Hats do not lead to hair loss. Speaking of blood circulation, many individuals believe correctly that blood flow to the scalp can influence hair growth and hair loss. This is true because your hair follicles need a constant and optimal flow of blood to deliver the oxygen and nutrients needed for hair growth. However, blood flow along will not cause hair loss or hair growth unless the supply is cut off completely. So, the myth that states that standing on your head in order to increase blood flow to the scalp will help increase hair growth is very untrue. The final and maybe most important myth surrounding hair loss is the statement that there isn't a treatment available that can treat or prevent hair loss. This one is definitely untrue. There are many effective and viable treatments and replacement options on the market today that can help stop hair loss, replace lost hair, or cover areas that are suffering from hair loss. If you have hereditary hair loss or have noticed an extreme thinning of your hair, it is best to seek out treatment before the condition gets too severe. For more information about the hair loss treatments that are available, read our features on Electric Pulse Treatment, Follicle Injections and Scalp Reduction Surgery. No i dont agree with you, this is my personal experince, blood flow to the scalp incease hair growth. my hair got thicker in 2-3 months by doing scalp massage. i know you people force us to buy and try all bogus hair products.